USDAC Cultural Agent Jess Solomon speaking at a public forum hosted by the Mayor’s Office in Washington, D.C., 2014. Credit: Marvin Bowser. All rights reserved. Known as the USDAC, the Department defines itself as “the nation's newest people-powered department, founded on the truth that art and culture are our most powerful and under-tapped resources for social change.” It’s focused at the moment on organizing a People’s State of the Union, a process designed to re-imagine the President’s annual address as a more playful, reflective and connective civic ritual. Of course it isn’t actually a government department. A group of artists launched the USDAC in autumn 2013, when the federal government had temporarily shutdown many of its operations because a highly partisan Congress couldn’t agree a spending bill for the next fiscal year. * Tell a story about a moment you felt true belonging—or the opposite—in this country or in your community. * Describe an experience that showed you something new or important about the state of our union. * Share about a time you stood together with people in your community. If people can’t attend a story circle, they can submit their story online. Fueled by the content of these stories, a team of poets led by the Minister for Poetry and Language Protection will then create the “Poetic Address to the Nation.” On February 1st, the Address will be performed at the Bowery Poetry club in New York (for tickets, click here) and broadcast live. After the event, everyone is encouraged to perform the poetic address locally in whatever forms they find enlivening. I recently interviewed five people with formal roles in USDAC to find out more about how a mock government department invented by artists is going to create a cultural paradigm shift and revitalize U.S. democracy. To maximize resources, the USDAC is building bridges between existing local grass-roots community organizing efforts and national policy and action. However, its primary role seems to be as a multi-generational training ground to grow networks of imaginative and conscientious co-creators—nourishing the inner artist in everyone. 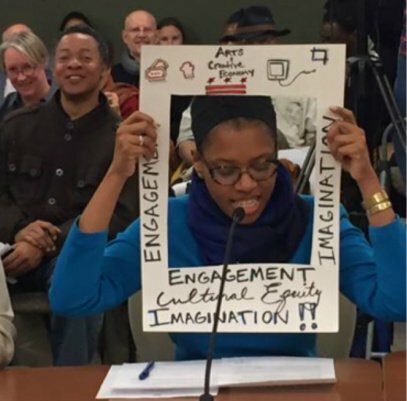 Its arts-centered actions like Imaginings—events at which people are encouraged to imagine the future of their communities at a time when USDAC Values are fully embedded in society—are aimed at helping participants to exercise their ‘muscles’ for imagination, empathy, compassion and reflection. Cultural Agents hosted the first round of Imaginings in a dozen locations around the USA in 2014. Jess Solomon, who is a Cultural Agent, hosted an event in Washington DC where people ate, imagined, and created art together to express their different visions. It concluded with an established artist drawing from the content of everyone’s contributions to improvise a performance piece. Unleashing creativity in this way is a risky business. In her interview, Solomon explained to me that she was struck by how uncomfortable the process of imagining can be for people. “Because you have to come to terms with questions like twenty years from now, who am I going to be and what is this going to mean?” But people did overcome their discomfort and left the event with a spring in their step and a greater confidence in their co-creative powers. For many people, the scariest aspect of creating a paradigm shift is to acknowledge and confront what lies inside of us. Artists are constantly creating resources for holding up a mirror to the nature of our relationships and the deep-seated beliefs and assumptions that underpin our militaristic, consumer-oriented, planet-destroying culture. If this sounds like weighty work, that’s because it is. Yet, the USDAC involves a huge amount of play. At its most basic level, its playfulness frees people from the conventional formality and constraints of bureaucracy that stifle imagination and creativity—things like dress codes, language, protocols, hierarchy and partisanship all of which can put people off and keep them from participating. The Department has pop-up offices that can be opened anywhere, like on a sidewalk. Its cabinet members make up their own titles. And the Deputy Secretary might make a speech while playing the accordion. Next week, when it broadcasts the “Poetic Address to the Nation,” the U.S. Department of Arts and Culture will issue a much more provocative invitation: Why don’t ‘we the people’ come together to co-create the world we really want to inhabit? And, of course, have lots of fun along the way.